Exclusive £5 Gift Card with Orders Over £40 at Myprotein Spend over £40 on your next order at Myprotein and get a £5 digital gift card! Once your purchase is verified we will email you how to claim. Discover 60% Off Orders at Myprotein Shop at Myprotein this Easter and find up to 60% off with this discount code! 35% Off Bestseller Orders at Myprotein Shop the bestsellers range at Myprotein and use this discount code to get 35% off. 40% Off Selected Orders at Myprotein Use this code to get incremental discounts: 40% off £50, 35% off £15 and 30% off with no min. spend. 33% Student Discount at Myprotein Shop Myprotein now and save with 33% off now! Free 250g of Whey Protein on Orders Over £60 at Myprotein When you order over £60 from Myprotein you get to choose from strawberry, coconut, banana or rocky road for a free 250g bag of Impact Whey Protein. Save 60% on Sports Clothing in the Sale at Myprotein Get geared up for less with the sale at Myprotein. Free Delivery on Orders Over £40 at Myprotein With orders over £40 at Myprotein, you'll get delivery for free! Protein Samples from 99p at Myprotein If you're a little unsure on what flavour to go for, or would like to sample something a little different without the commitment of several kilos of the stuff, then order samples from as little as 99p! It's your body and now it's your protein. For the past 11 years, Myprotein has been on a mission to become the world's biggest sports nutrition brand by 2020. We can vouch that they are well on their way with consistent value, quality and innovation in everything that they offer - get to know what they're all about to save on a world of health and fitness goods. Whether you’re a novice to health and fitness or an elite sportsperson, Myprotein will have the solution for you. With constant product launches, innovation and expertise behind new and exciting goods are always just around the corner. Whatever your goal, be it weight loss, lean muscle, sports performance, endurance or other - the team at Myprotein know that when it comes to nutrition, it isn’t just a case of one size fits all. The range of products on offer is very diverse so you can purchase exactly what you need in bulk or a small test batch to make sure you’re tailoring your plan to your body. Shop the range by ailment such as sports recovery, by ingredients that are Free From or organic, and you can even find apparel to support your every move. How do I use a Myprotein discount code? Click 'use code' for your discounts to be applied and continue to checkout securely. Sign up with your email address to the Myprotein newsletter for easy gains. Now you can get offers, tips, tricks and more sent straight to your inbox. Can I get Myprotein free delivery? Yes, when you spend over £75. When is the Myprotein sale? There may be sales throughout the year, meanwhile, you can shop the voucher codes page to find plenty of offer codes and special discounts so that you can save on your goods all year round! To track your order, you can log in to your account to see the date that your order was dispatched. You will also be sent an email informing you of when your order left along with a link to the courier's website so that you can check the location of your goods. Next Day and Saturday Delivery are also free over £75 - order by 9pm. Next Day and Saturday delivery costs £3.95 otherwise. Premier Next Day Delivery (£4.99) and designated Saturday/Sunday Delivery (£5.99) are also available. Myprotein don't offer free returns - get in touch with the customer services team to request a returns number and receive the appropriate address. You can also log-in your account here to reach Myprotein online. Keep your motivation and progress going with the brilliant products from Myprotein, who offer an enormous range of top notch health and fitness supplements at brilliant prices. 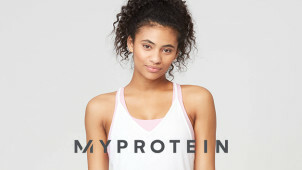 With more than 300 products available to purchase online, from oils and herbal remedies to whey protein, creatine and training apparatus - shop with a Myprotein discount code and you can be sure to get all your health needs sorted without breaking the bank! How do I use a My Protein discount code? Myprotein.com operates a rewards scheme so that you can get even more out of your summer shop with them. You simply gain rewards every time you shop, earning one point for every £1 you spend. These points can be redeemed at the checkout so keep checking how many you have by logging into your account and soon you'll be able to stock up on your protein shakes or healthy snacks with an even bigger discount. Plus, if you refer a friend - you'll get even more points when they shop! Summer is a great season for nature and you can keep your supplements natural with the organic range at Myprotein.com. This is full of amazing, raw and powerful products to support you in your fitness goals and in general day to day life. With Myprotein voucher codes you can save on choosing organic and wholefood goods which can be highly beneficial to your wellbeing. With snacks, high-protein seeds, super teas and more - you'll be full of zing in no time.